If you’ve been around Babyology for a while, you’d know that we adore wooden toys – the tactile nature, the quality construction and the timeless appeal for fun mean a win for kids and parents alike. 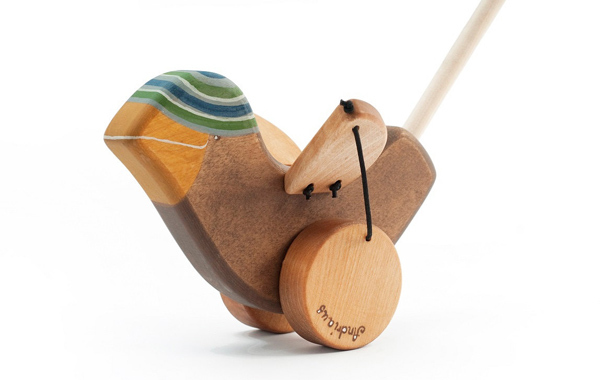 Friendly Toys have created a range of wooden toys that are not only stunning to look at but also hardwearing to play with. Inspired by a tree change and the birth of their daughter, Sigita and Donatas began creating wooden toys at their home in Lithuania. It wasn’t long before they made it official and Friendly Toys were in demand across the seas. Their original vision has never wavered though – to encourage a child’s bond with nature by creating a safe and natural friend for them to play with. Friendly Toys are quality crafted and sanded satin smooth. All materials used are natural, biodegradable and safe for children. From hand-crafted wooden teethers to pull-along toys and rocking horses, there is an extensive range of toys in the Friendly Toys collection. I’m a sucker for pull-behind toys like the adorable blue horse (pictured at top), and this wooden sparrow push toy with flapping wings will provide endless entertainment for toddlers who are just getting their feet under them. I love that each toy Friendly Toys makes comes with a story to capture the imagination of their new owner. What really sets Friendly Toys apart however, is their option to personalise toys with any text. 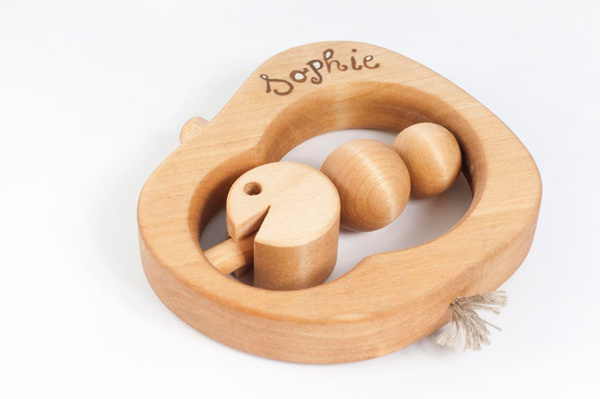 Perfect for a special gift for a newborn, Christening or first birthday, a personalised toy from Friendly Toys will be a treasured keepsake for a lifetime. You can purchase personalised toys from the Friendly Toys range through their Etsy store. All items are made to order and can be shipped worldwide from Lithuania.